CHATTANOOGA, Tenn. - Jurors in whose hands rest the fate of the former president of the nation’s largest diesel fuel retailer and three subordinates went home Feb. 7 after nearly four hours of deliberations and no verdict. U.S. District Judge Curtis Collier suspended deliberations until Feb. 12, citing a conflict with a juror’s schedule, after the panel spent just less than four hours Feb. 7 considering the fraud case presented by Assistant U.S. Attorneys Trey Hamilton and David Lewen over the past four months. Former Pilot Flying J President Mark Hazelwood, former vice president Scott “Scooter” Wombold, and former account representatives Heather Jones and Karen Mann have been standing trial since November in U.S. District Court in Chattanooga on charges including conspiracy to commit wire and mail fraud. They are accused in a five-year plot within the direct sales division of Pilot Flying J to use promises of hefty diesel fuel discounts to lure trucking firms to do business with the truck stop giant and then shorting those firms on what they were promised. Fourteen former Pilot Flying J executives and staffers have pleaded guilty. Two others were granted immunity. Pilot Flying J’s board of directors has confessed criminal responsibility and paid out $92 million in criminal penalties and another $85 million in lawsuit settlements. The board is also picking up the defense bills for its former staffers, including Hazelwood. CEO Jimmy Haslam, who also owns the Cleveland Browns, has denied knowledge of the fraud scheme and is not charged. 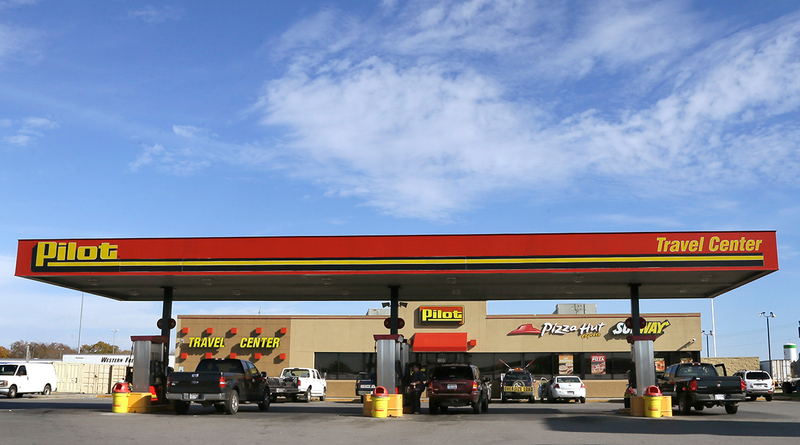 Agents with the FBI and IRS Criminal Investigation Division raided Pilot Flying J’s Knoxville headquarters on Tax Day 2013 after having convinced former sales executive Vincent Greco to secretly record meetings at which the fraud scheme was discussed. Jurors have heard roughly 20 days of testimony by 26 witnesses, viewed hundreds of exhibits, including incriminating emails, and listened to secret recordings that not only captured fraud talk but also caught Hazelwood and his salesmen making racially offensive comments, using racial epithets, and mocking the Browns, the team’s fans and Pilot Flying J board members. Jurors spent the morning of Feb. 7 listening to Hamilton push back against defense claims that the government had ginned up a criminal case out of what was, at worst, unsavory but legal business practices. Hamilton displayed emails and played snippets of secret recordings to back up his argument that Hazelwood, Wombold, Jones and Mann all knew that trucking firms were being cheated behind their backs, and each played a key role in that fraud conspiracy. Mosher, who has confessed guilt and testified in the trial, was supervised by Wombold and promoted by Hazelwood, who predicted in one secret recording would one day rise to take over his job. Hazelwood’s lead attorney, Rusty Hardin, contends Mosher and another fraudster – former vice president John “Stick” Freeman – were leading the scheme underneath the noses of his client and Hazelwood’s boss, Haslam. He said Hazelwood is, as Haslam contends about himself, innocent. Attorney David Rivera has told jurors Wombold, who was captured on those secret recordings involving fraud talk, was being pushed out of the firm by Mosher and Freeman and did his best to “encourage” honest Pilot Flying J staffers to stay that way. Attorney Jonathan Cooper told jurors Feb. 6 that Mann never lied to anyone, including customers, and was merely acting on orders from her bosses to make changes to fuel discounts. Hamilton tackled each defendant’s argument in his rebuttal Wednesday morning. He said Mosher secretly recorded teaching the “art” of fraud at a mandatory training meeting at Pilot Flying J headquarters in November 2012, was the teacher of “rebate fraud school,” and Jones was his “teacher’s aide.” She was captured on that same recording telling attendees few trucking companies were zealous enough to seek documentation of the discounts paid. Jones’ pay grew from $68,000 in the early days of the conspiracy to $115,000 in 2012, he noted. She earned commission from diesel fuel sales. Hamilton said Mann’s pay grew, too, rising from $92,000 to $117,000 during the five-year conspiracy. He showed jurors emails to which Mann responded that overtly discussed fraud. Hamilton mocked Wombold’s claim of trying to discourage fraud, playing for jurors snippets of secret recordings in which fraud was discussed and Wombold participated in those conversations. As for Hardin’s claim that Mosher was the real bad guy, Hamilton scoffed. “Mr. Hazelwood is the one who trained Mr. Mosher,” Hamilton said. And, Hamilton argued, it wasn’t Freeman who was pushing the fraud scheme. It was Hazelwood, as captured on secret recordings from a February 2013 meeting at which Hazelwood discussed further dividing trucking customers to figure out which firms closely monitored fuel rebates and which ones didn’t. “We got Manuel. Manuel does a helluva job,” Hazelwood said on the recording, making a reference to the nickname the confessed fraudsters testified they used for the scheme. The prosecutors did not call Freeman as a witness. He is awaiting sentencing.